Person Responsible: J. Gutt et al. Julian Guttwith contributions from SC members (from Argentina, Canada, Germany, Japan, New Zealand, Portugal, South Korea, Spain, UK, USA. • Scientific output.Two papers published as a unique product of AnT-ERA. More than 500 additional papers fell into the scope of AnT-ERA. • Capacity building: (a) Mini-workshop during OSC, 2016; (b) multiplesupport of the 2016 OSC and 2017 SCAR Biology Symposium; (c) approx. 10 additional events co-chaired by SC members, e.g. ANTOSand APECS. • Dissemination/products. Key "tool" was the dynamic AnT-ERA webpage with ∼100,000 hits between 2013 and 2017. At present announcements for events and job opportunities are sent regularly to the approx. 520 mailing list members. AnT-ERA contributed to a wide range of SCAR products, e.g. 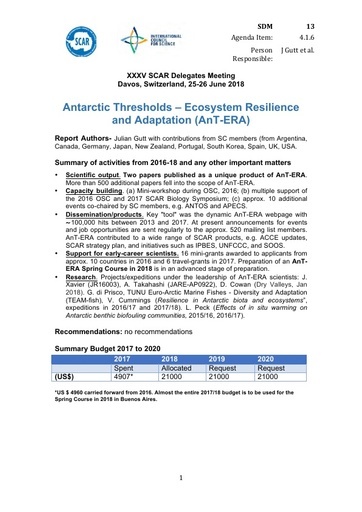 ACCE updates,SCAR strategy plan, and initiatives such as IPBES,UNFCCC, and SOOS. • Support for early-career scientists.16 mini-grants awarded to applicantsfrom approx. 10 countries in 2016 and 6 travel-grants in 2017. Preparation of an AnT-ERA Spring Course in 2018 is in an advanced stage of preparation. • Research Projects/expeditionsunder the leadership of AnT-ERAscientists: J. Xavier (JR16003), A. Takahashi (JARE-AP0922),D. Cowan (Dry Valleys,Jan 2018). G. di Prisco, TUNU Euro-Arctic Marine Fishes -Diversity and Adaptation(TEAM-fish), V. Cummings (Resilience in Antarctic biota and ecosystems”, expeditions in 2016/17 and 2017/18). L. Peck (Effects of in situ warming on Antarctic benthic biofouling communities, 2015/16, 2016/17).